The Print Room has managed to stumbled blindly, if not blithely, into the year’s first theatre controversy, and it proves to be the most interesting thing about this production of Howard Barker’s new play, In the Depths of Dead Love. The playwright has made a specific decision to set the play in ancient China and to assign its characters Asian names. Yet director Gerrard McArthur and his casting director Siobhan Bracke chose to cast it with an all-white cast; actors of East Asian descent were not auditioned. 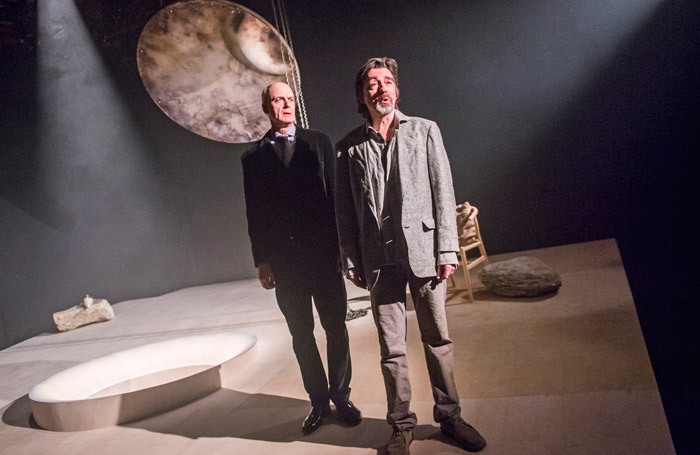 When Trevor Nunn employed an all-white cast for his production of The War of the Roses at Kingston’s Rose in 2015, he cited the requirements of “historical verisimilitude”. Here, the theatre is performing an act of whitewashing, claiming to speak for the play’s universality by calling it “in fact a very ‘English’ play”. While it’s true there is nothing inherently Chinese in the play’s substance or characterisation, that only compounds the issue. Why not use ‘English’ names? The plot revolves around a bottomless well, presided over by a poet called Chin, who charges visitors a small fee to use it to commit suicide. Is this a Chinese version of Dignitas? A 67-year-old woman (a dignified but desperate Stella Gonet) is a daily visitor, but can’t summon the nerve to do it. Her husband Lord Ghang (William Chubb) eventually urges Chin to push her in. Will he, won’t he? There’s not much to sustain dramatic tension across 90 minutes. The play is very hard going, and I couldn’t help thinking that the large body of protestors outside the theatre on the first night were at least spared having to watch it, let alone perform in it.